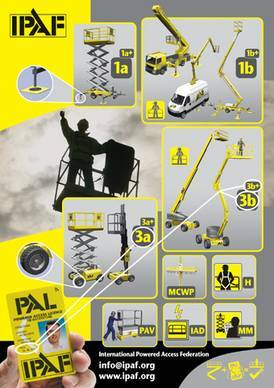 IPAF's (International Powered Access Federation) Demonstrator course is a 1-3 day training course aimed at persons who need to familiarise Operators with their responsibilities and demonstrate pre-operational and safe operating procedures, and the limitations of mobile elevated work platforms (MEWPs). On successful completion delegates will receive a Internationally Recognised certificate (valid 5 years). This course is aimed at persons who's work includes or will include the need to familiarise Operators with their responsibilities and demonstrate pre-operational and safe operating procedures, and the limitations of mobile elevated work platforms (MEWPs). As the safe use of Mobile Elevating Work Platforms (MEWPs) requires that you consult safety notices and read and thoroughly understand the manufacturer’s instruction manual, literacy and language comprehension are important requirements for any MEWP user. Similarly, as the assembly and use of MEWPs can be physically demanding, users should be physically fit and in good health and should, generally, not have problems with eyesight or hearing, heart disease, high blood pressure, epilepsy, fear of heights / vertigo, giddiness / difficulty with balance, impaired limb function, alcohol or drug dependence or psychiatric illness. If you have any problems with literacy or language comprehension, or have any doubts about your fitness to use MEWPs, you must bring them to the attention of your employer. This need not preclude you from using MEWPs, provided your employer conducts an assessment and is able to put into place adequate measures to take account of any difficulties you may have.